I'm a bit of a concrete fiend. I like my ice cream (or custard, as it were) with mix-ins. Lots of delicious mix-ins and Shake Shack delivers. Each Shack has it's own unique concrete menu, many of which are inspired by their location. 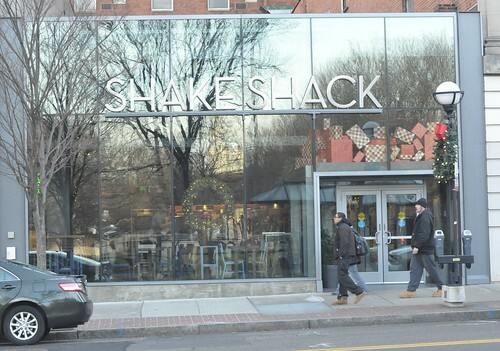 For the New Haven Shake Shack they tip their hat to old Eli Yale with the Skull and Cones, a cheeky tribute to the infamous secret society. 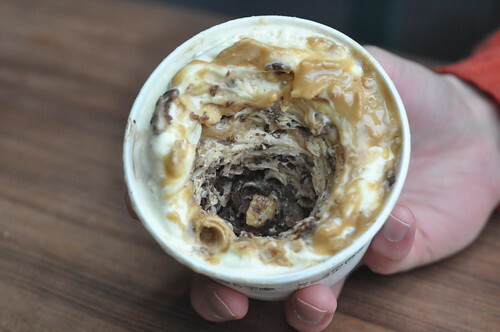 But really, how can you go wrong with both vanilla & chocolate custard plus, crunchy waffle cone bits, plus peanut butter and chocolate cookie dough. The effect is crunchy-chewy-gooey-goodness. In the interest of Yuletime moderation (as if there were such a thing!) Lawman and I ordered a half concrete. HUGE mistake, as we soon found ourselves scraping the bottom of the cup longing for the other half. Heed our advice and get a whole (or better yet, get your own, you won't want to share this one).